Saint Mary Magdalene, friend, and follower of Jesus, help me to recognize my sins so that I may seek forgiveness and that I, too, may be exorcised by Him. Pray for me so that I, too, may be closer to Jesus and love Him as my Divine Savior. Pray for (mention your petition here) so that they too may see our Lord Jesus Christ and seek forgiveness for their sins so that they too may always seek the Lord and follow Him. Help us to persevere to the end so that we will be saved. O my God, I am heartily sorry for having offended Thee, and I detest all my sins because of Thy just punishments, but most of all because I have offend Thee, my God, Who art all-good and deserving of all my love. I firmly resolve, with the help of Thy grace, to sin no more and to avoid the near occasions of sin. Saint Mary Magdalene, friend, and follower of Jesus, our Lord cured you of evil spirits and ailments. Pray that we may be delivered from evil. Lord, help me to examine my conscience as I pray. O my Jesus, forgive us our sins, save us, from the fire of hell, lead all souls to Heaven, and help especially those most in need of Your mercy. Saint Mary Magdalene, friend, and follower of Jesus, Our Lord forgave you for all of your sins. Pray that we may truly seek forgiveness for our sins. Saint Mary Magdalene, friend, and follower of Jesus, you were so filled with sorrow and remorse over your sins that you anointed Christ's feet with perfumed oil. Pray that our remorse for our sins may be a sweet fragrance to our Lord. Lord, help me to examine my conscience as I pray. O my Jesus, forgive us our sins, save us, from the fire of hell, lead all souls to heaven, and help especially those most in need of Your mercy. 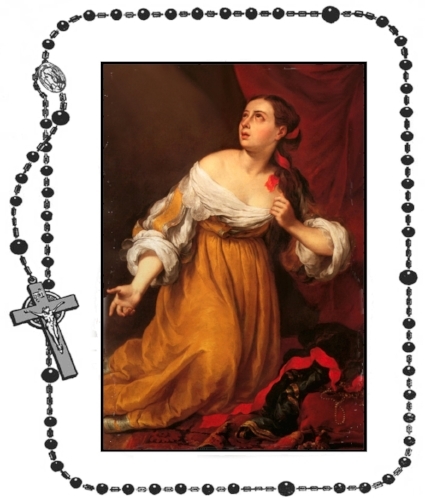 Saint Mary Magdalene, friend, and follower of Jesus, you wept at the foot of Christ and your tears fell upon His feet. You kissed and wiped His feet with your hair. Pray that our tears of sorrow will fall upon the feet of Jesus and that our Lord will wipe away our sins. Lord, help me to examine my conscience as I pray. O my Jesus, forgive us our sins, save us, from the fire of hell, lead all souls to heaven, and help especially those most in need of Your mercy. Saint Mary Magdalene, friend, and follower of Jesus, you stood at the foot of the cross and saw our Lord Jesus Christ being crucified to His death. Pray that we may recognize and witness to other that Jesus did this for us. Lord, help me to examine my conscience as I pray. O my Jesus, forgive us our sins, save us, from the fire of hell, lead all souls to heaven, and help especially those most in need of Your mercy. Saint Mary Magdalene, friend, and follower of Jesus, you saw His lifeless body taken from the cross and placed in His mother's arms. Pray that Our Blessed Mother will hold us at the hour of death in her arms. Lord, help me to examine my conscience as I pray. O my Jesus, forgive us our sins, save us, from the fire of hell, lead all souls to heaven, and help especially those most in need of Your mercy. Saint Mary Magdalene, friend, and follower of Jesus, you saw Him being placed in the tomb. When we die, pray that we may be buried on sanctified ground. Saint Mary Magdalene, friend, and follower of Jesus, when you went back to the tomb and did not find the Lord's body, you thought it had been taken away. Pray that our souls are not taken to hell. Lord, help me to examine my conscience as I pray. O my Jesus, forgive us our sins, save us, from the fire of hell, lead all souls to heaven, and help especially those most in need of Your mercy. Saint Mary Magdalene, friend, and follower of Jesus, you stood outside the tomb weeping. Pray for our family, relatives, and loved ones so that they may be consoled and comforted when we die. Lord, help me to examine my conscience as I pray. O my Jesus, forgive us our sins, save us, from the fire of hell, lead all souls to heaven, and help especially those most in need of Your mercy. Saint Mary Magdalene, friend, and follower of Jesus, upon seeing our Risen Lord from the dead, you were overwhelmed and filled with joy. Pray that we too may see the Risen Lord and that our final resting place will be in Heaven with God the Father. Lord, help me to examine my conscience as I pray. O my Jesus, forgive us our sins, save us, from the fire of hell, lead all souls to heaven, and help especially those most in need of Your mercy.